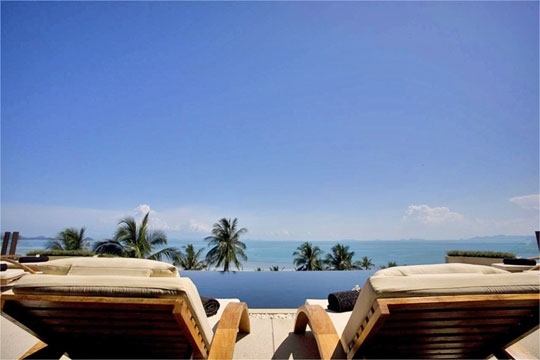 Villa Nava’s owners clearly designed their tropical island getaway with family in mind and have created a social, warm and welcoming home as a result. 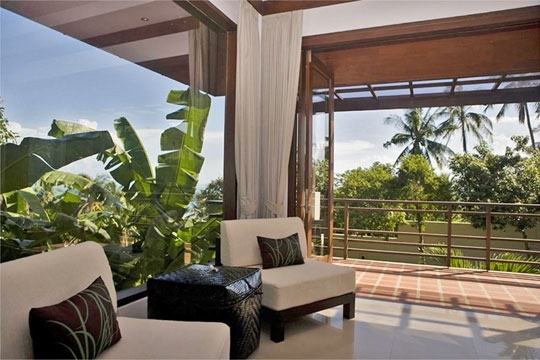 Carefully planned to optimize the delightful hillside location, every room at the villa boasts a furnished terrace from which to admire the splendid ocean and island views. The infinity edge of the small but perfectly placed pool falls away to well-tended gardens bursting with bright tropical blooms, and a comfortable westward-facing sala to one side of the pool terrace makes an idyllic spot to sip sundowners and admire the spectacular sunsets. Living, dining and kitchen areas are arranged to merge informally from one to the next, but each with its own stylish décor and mood, and all with the same glorious views. On the lower floors of the three-storey main building are a spacious master suite and a triple-bedded kids room, while, privately situated in the gardens, is a two-bedroom guest bungalow that makes ideal accommodation for extended family, friends, or a second family group. Villa Nava is well provided with kids’ equipment and games (including cots, high chairs, car seats, Sony Playstation, toys, movies, etc. ), and youngsters and adults alike will be warmly looked after by Irene, the manageress, who tends to the villa and its guests with cheerfulness and charm. Guests can opt to self-cater or to hire in a cook who shops for and prepares Thai and Western meals for a very reasonable fee plus the cost of the groceries. A car and driver can be booked for airport transfers, and hired for island sightseeing through Irene (both extra charge). 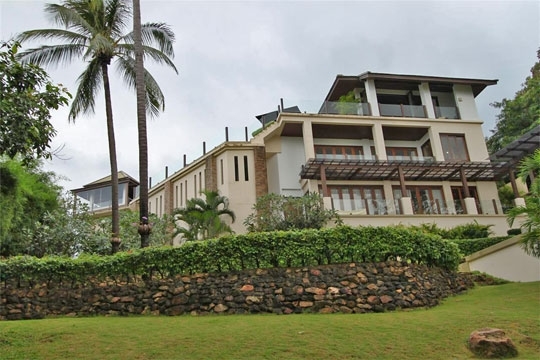 Secluded, sunny hillside haven with 180-degree ocean views. We felt instantly at home at Villa Nava; partly because of the villa’s comfortable furnishings and convivial layout – it seems the most natural thing in the world to walk through the front door, drop your bag and grab a stool at the big white breakfast island to chat with whoever’s in the kitchen – and partly because Irene, the villa’s lovely manageress, radiates a motherly warmth that just makes you feel relaxed and looked after straight away. Irene met us at the foot of the steep hill that Nava is built on and smilingly escorted us up to the villa, where, on entering through the double doors, we were greeted by the beautiful view out over the pool and palm tops to a sparkling ocean dotted with tropical island gems. 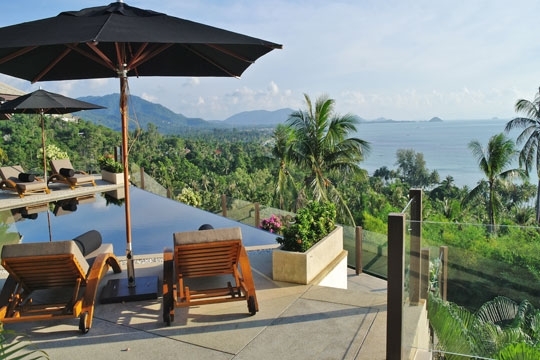 Pristine forested hills and Samui’s attractive coastline disappear southwards, with Nathon town’s long jetty just visible in the mid distance. Villa Nava’s living room, dining area and kitchen are almost totally surrounded by glass (most of which folds back to create a bright open-sided space) providing easy access to the pool and the breezy sala where, come evening, we sat on black-cushioned sofas toasting the magnificent sunsets. The bedrooms, split two in the main house and two in the guest bungalow, are well set up for a couple of families or for an extended family (as long and grandma and grandpa are not hampered by stairs – as there are quite a lot of them between the bungalow and the main living floor), and we liked that all the rooms offered pleasant outdoor terraces for a quiet read or rest. The villa is self-catering, but Irene will help with the shopping and even organizes for meals to be delivered from some nearby restaurants. 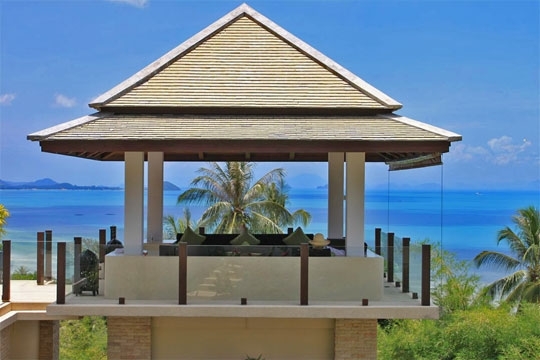 Alternatively, a local cook will come to the villa and prepare mouth-watering Thai cuisine for a very reasonable charge. The conviviality of the indoor and outdoor living areas is a highlight at Villa Nava, making it feel a true home away from home, but one with views that most of us can only dream about. Having Irene and her handyman husband around to keep everything in order takes away all the usual stresses of daily life leaving you free to enjoy time with family or friends – just what holidays are all about. 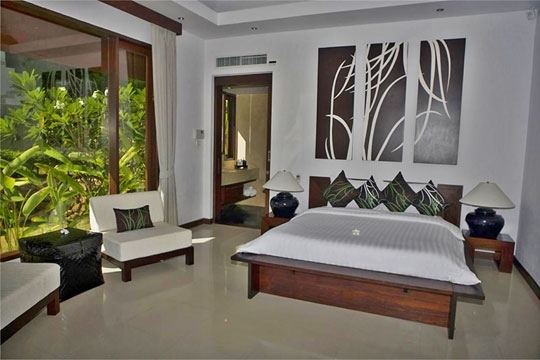 While we loved Nava’s living areas, we felt that the bedrooms were a little sparse and the bathrooms a trifle dated. But let’s face it, you’re unlikely to spend much time in these rooms other than when you’re asleep – and the beds were very comfy. The villa’s back-up generator wasn’t working during our visit (Dec. 2012), which was bad news as there was an extended island-wide power cut, but the owner assured us that all would be in working order again very soon. 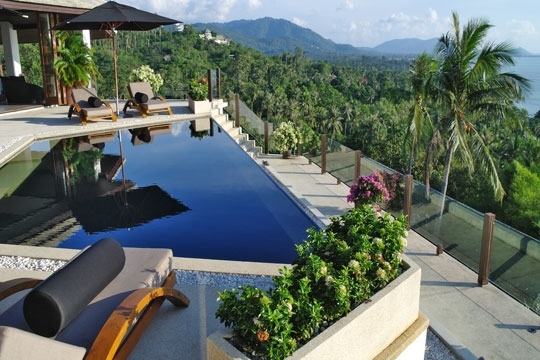 Villa Nava is situated a short distance up a steep forested hill on Samui’s north west coast, just a stone’s throw from the Four Seasons Hotel and a quick walk away from a gentle, sandy beach – good for paddling and catching crabs. The authentic small port of Nathon, where regular ferries depart for the Thai mainland, lies a couple of kilometres to the south and is an interesting place to visit for those who want a glimpse of the less touristy side of the island. 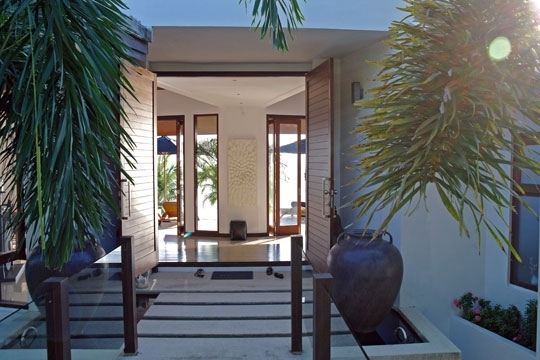 From Villa Nava’s carport and gateway a path zigzags down to cross a water feature before arriving at an imposing double doorway, through which wide ocean views are revealed. 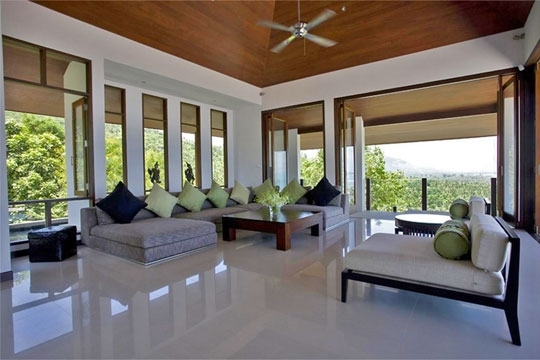 The villa has been designed to maximize the panorama from every angle and an expanse of glass doors enhance this by folding back to create a wonderfully tropical indoor-outdoor living space. To the far left, comfortable sofas face a 42-inch satellite TV/DVD player, and look out to the views beyond. 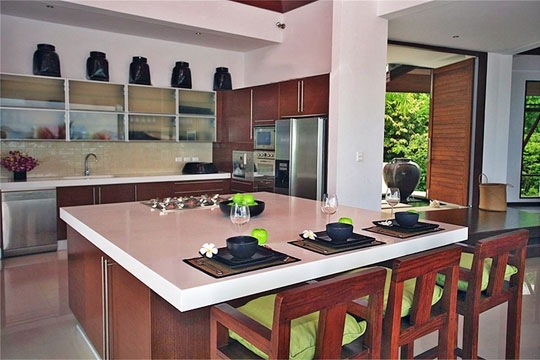 Next to the lounge is an eight-seater dining table and to the right of that, a spacious kitchen, well equipped with Smeg appliances, plus a big breakfast island that makes a great spot to socialize and snack, opening to the pool deck on two sides. A covered barbecue area is conveniently situated next to the kitchen and, beyond that, a fan-cooled sala presides over the pool and gardens; built-in sofas poised for spectacular sunset panoramas. 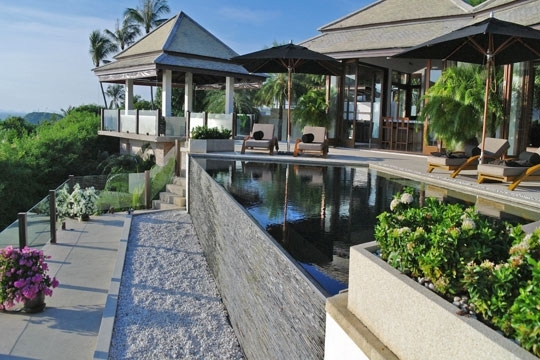 A broad terrace, furnished with shady sun loungers, wraps around three sides of the 8 x 3m infinity pool. Stairs leads down from the dining area to the master bedroom and the same-sized kids bedroom on the floor below. Both rooms are equipped with air conditioning, 32-inch satellite TV/DVD players (plus a Sony Playstation in the kids room) and feature folding glass doors opening widely onto furnished balconies and coastal views. A large dressing room lies to the rear of the king-bedded master whose ensuite bathroom is fitted with an oval terrazzo tub, twin vanities and shower. 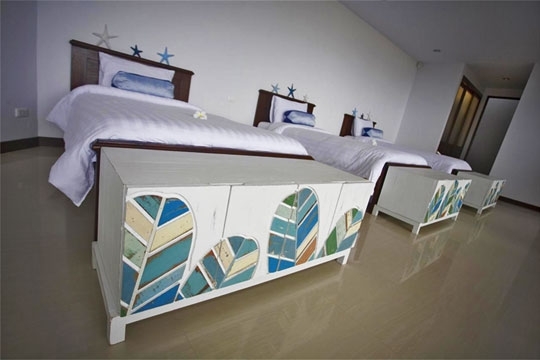 Three single beds stand sentry in the kids room, each with a hand-painted storage chest at its base. In one corner is a nest-like bamboo ‘den’, while blue floor cushions around a low table and a big box of toys complete the picture. 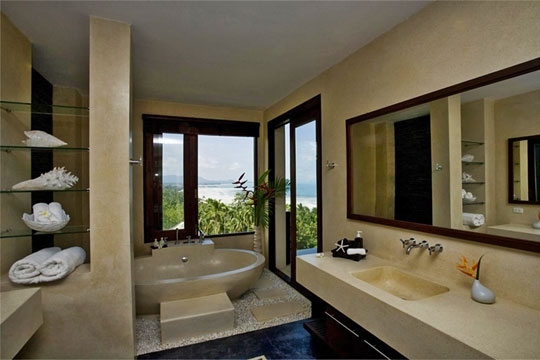 The ensuite bathroom is fitted with a large tub, double washbasins and shower. In the gardens, privately situated below the main house, is the guest bungalow. Two identical, bright, air-conditioned rooms open through wide glass doors from a shared terracotta-tiled balcony, simply furnished with queen beds, side tables, easy chairs and 32-inch TV/DVD players. Ensuite bathrooms feature moulded terrazzo washbasins and baths and glassed shower cubicles. Fitted wardrobes and small vanity areas line one wall. 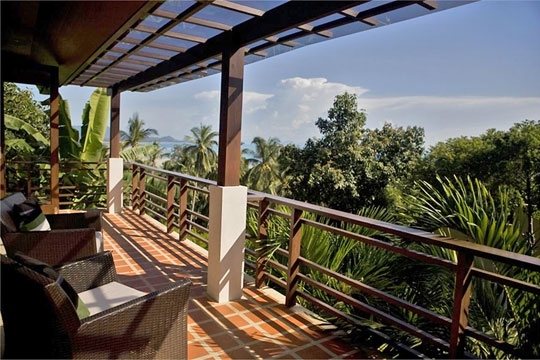 4 bedroom villa located in Bang Por-Nathon, Koh Samui. 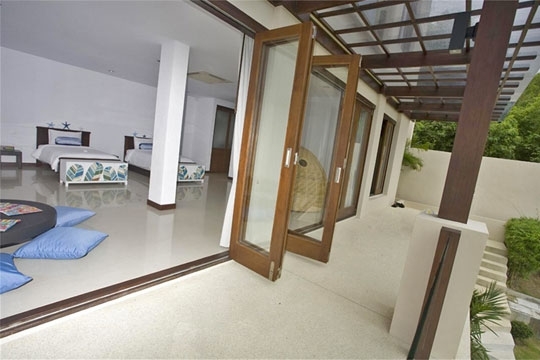 Ideal for Beach in ten, Body and soul, Bring the relatives, Kid friendly, Room with a view.